A Backyard Pond Can Be the Highlight of Your Outdoor Area. Plan Carefully! 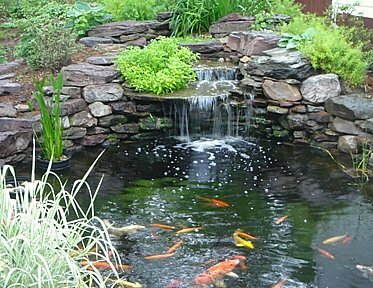 A backyard pond can be the center of attention in your backyard design. It can compliment the other features in your yard or it can be the focal point with other features blending around it. But if you don't take the time to think and plan, a backyard pond can become a nightmare. A water project is part art, part engineering. Of course you want it to be beautiful, but it has to be designed to function properly. Depending on your wants, it may have to support plants, animals or both. Like all things, in order to properly plan - you need to know what the options are and what requirements those options involve. So before you start buying components and digging holes, take some time to plan! What do you want from your backyard pond? In related articles we can consider the particulars of each type of design, but for now let's get to some basic decisions you will need to make before we can decide what those particulars are. For example...do you want to have fish in your pond? A koi pond or a goldfish pond might sound great or it may be the last thing you want. But you need to decide up front because the ponds can be very different. Do you plan to have plants - a water garden - in your backyard pond? Or maybe you just want the sights and sounds of the water without the flora and fauna. Those decisions will affect the type of filtration and aeration you'll need, as well as the size and depth of your backyard pond. Any pond will attract some wildlife to your backyard. Birds and butterflies are attracted to water. Turtles and frogs need water to live. If you don't want plants or animals - chlorination will serve to keep the water clean and clear as well as discourage most animals. So you need to think about what you want and then make a few decisions so that your end result will match your wishes. Do you want other water features combined with your pond? 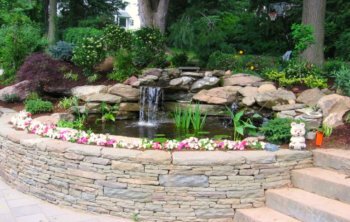 Often there are other water features combined with a backyard pond. Maybe a fountain would look great in the center of your pond. How about a gently flowing steam feeding into your pond? Maybe a dramatic multi level waterfall cascading downward into the pond is what you have in mind. As you can imagine, all of these decisions have a great impact on how you need to plan toward your final project. Maybe your current budget doesn't allow you to do everything you'd like to all at once. No problem - just be careful to plan out the initial phase of your backyard pond with the future design in mind and you'll be able to add other components over time. How will you get electricity to your pond - and how much electricity will you need? Your project will require some electricity. Well, if you just dig a hole and put water in it, maybe not. If that's your plan, just wait an the next mud puddle after it rains - that's what your pond will look like anyway. Filters and pumps require electricity. Waterfalls and fountains have pumps that will require more power. What about lighting? If you will want low voltage lighting around or inside the pond - you will need power for it. So, depending on the components involved in your overall design, you may need multiple circuits. It's best to talk with a qualified electrician during the planning stage to make sure you can actually do the things you want to do. As you plan, make sure your design will actually fit into your backyard. Make a rough drawing and then lay out a general outline on the ground using a rope, an electrical cord, or a garden hose. How about the slope of your yard? A stream fed waterfall cascading into a beautifully landscaped backyard pond will not work on flat ground. Holes can be dug and dirt can be moved, but it is usually best to try and take advantage of the natural slope of your yard. If you have a flat backyard - don't despair. There are still ways to get the starting height needed for your design. How big should your pond be? How deep? That will be determined by several factors we will consider in the related articles. Just keep in mind - it is very unusual for someone to wish their backyard pond was smaller. Wishing for a larger one is common. There are pros and cons to each, but any of the three can do a fine job. Pond liners are probably the easiest method to use and the cost is reasonable. PVC is a less expensive liner option, but a butyl rubber liner will last longer, primarily because it is stronger than PVC. Liners can be punctured or torn so an underlayment is highly recommended. While easy and relatively inexpensive, pond liners do not last as long as the other methods. Concrete offers the least expensive option, at least initially. Long term maintenance can cause the expense to go up significantly, but if everything is done properly up front, you should be okay. A professional is usually your best bet here. The key is proper waterproofing. Concrete is porous, so you will have to be sure a waterproof coating is applied correctly. Fiberglass is the most expensive option, but it is also the longest lasting. Isn't it strange the way that seems to work out? Even though fiberglass is strong, you will need to be sure it is supported evenly. If not, it may crack if stepped on or subjected to other stress. A form fitting sand underlayment is one way to provide uniform support under and around a fiberglass pond. Regardless of the method you choose, a center drain is recommended. The drain needs to be located at the lowest part of your pond. This provides a way to clean the pond thoroughly since debris will naturally gather in the lowest point. Take your time - plan carefully - know and consider each option. Then take the "plunge" into your backyard pond!